Self-Myofascial Release, or SMR, is a stretching technique in which an implement such as a foam roller is used to apply pressure to tight muscles to trigger a relaxation response. SMR relieves painful knots within muscles without the price tag and inconvenience associated with a professional massage. When your tight muscles become more relaxed, you will find yourself with improved flexibility, a wider range of motion in your joints, as well as decreased soreness and tension. With time, SMR has a great corrective effect on common muscle imbalances which lead to postural problems and predispose one to injury. Since overactive (tight) muscles are the cause of poor posture, using SMR on these problem areas will allow your body to return to a more natural posture with time. Regular use of SMR also breaks up adhesions (scar tissue) within individual muscles and between muscles to improve quality of movement and reduce pain. SMR is cheap, easy, and highly beneficial to the vast majority of exercisers. It’s basically like giving your muscles a deep tissue massage using nothing but a foam roller or other implement and your own body weight. If you are using a foam roller, simply place the roller on the floor and lay upon it with the roller placing pressure on the muscle you wish to target. Roll slowly around on the targeted muscle until you find the most tender point, then relax and roll slowly back and forth until you feel a release of tension, which will usually happen between 30 seconds and a couple of minutes in the case of very tight muscles. How Does Self-Myofascial Release Work to Make Muscles Relax? Muscles attach to bones via tendons, tough bands of connective tissue. In the tendons dwell a special kind of sensory receptor called the Golgi tendon organ (GTO). The GTO senses tension in the muscle and when excessive tension or stimulation is detected, it sends signals to the muscle which cause it to relax, releasing tension and allowing lengthening. This is called autogenic inhibition, meaning the muscle is receiving inhibitory signals from within itself. The GTO needs about 30 seconds of stimulation to go through the process of autogenic inhibition and cause the muscle to relax. Thus, you’ll want to roll each muscle for a minimum of 30 seconds for SMR to work. If a particular muscle is quite tight, roll it for 1 or 2 minutes, especially when you’re first getting started with SMR. As you integrate SMR into your training program, you’ll notice that your muscles become less tense at their baseline level, meaning you won’t need to devote as much time to rolling. When Should I Perform Self-Myofascial Release? SMR is best performed at the very beginning of your workout as part of your warm-up and at the end during your cool-down. Go through your SMR routine before doing any static or dynamic stretches, but do warm up first for about 5 minutes with a light jog or walk. You should be warming up before ANY workout in this way. A light jog or walk gets the blood flowing throughout the body, increasing your core temperature so your muscles can contract properly and your joints can be safely taken through their full ranges of motion. After working out, doing your SMR routine again during your cool-down helps restore your muscles to their ideal resting lengths and tensions, meaning you will recover more easily, and your posture and flexibility will be improved with time. Who Should Use Self-Myofascial Release? The benefits of SMR apply to everyone from absolute beginners to highly conditioned athletes. SMR is a very versatile and effective modality which is beginning to garner wide acceptance among trainers and exercisers due to its efficacy and ease of use. The National Academy of Sports Medicine recommends SMR be integrated into all levels of training programs, from the beginning corrective level all the way through advanced performance training. It’s simple: anyone who wants to increase flexibility and range of motion, decrease muscle pain and tension, relieve soreness, and prevent injury resulting from excessively tight muscles can benefit greatly from SMR. That pretty much covers all you readers, right? Who doesn’t want to become more flexible, relieve soreness from your tough workouts, and prevent injuries which could leave you sidelined? 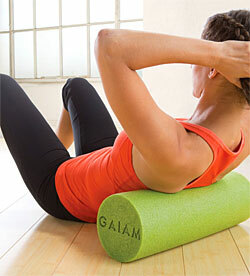 The best foam rollers are made of high-density foam for resiliency. Available in a variety of sizes and textures, they range from basic and affordable to fancy and a bit more expensive. So should anyone NOT use Self-Myofascial Release? And are there any DON’TS? DON’T roll recently injured areas. Allow the injury to heal before attempting to exercise the area. DON’T roll over bony prominences or over joints themselves. Stick to tender areas on the muscle itself. Otherwise, it’s possible to bruise your tissues or tweak your joints. SMR is best used in conjunction with other forms of flexibility training for maximum results. Integrate the use of a foam roller with your static and/or dynamic stretching routine to experience accelerated progress. An extended SMR program is also a great choice for recovery days. As with any flexibility program, or exercise program in general, it takes time to experience the full range of benefits or SMR, so give it a chance and then stick with it! 1. Clark, M.A., Lucett, S.C., and Sutton, B.G., (Eds.). (2012). Flexibility training concepts. NASM essentials of personal fitness training. Philadelphia: Lippincott Williams & Wilkins. 2. Rasminsky, A., Richardson, M., & Tang, H. (2008). Release Me. Dance Spirit, 12(8), 84-85. 3. Robertson, M. (2008). Self-myofascial release: Purpose, method, and techniques. Robertson Training Systems, www.robertsontrainingsystems.com.